Born 1974 in Tokyo. Graduated from Musashino Art University in 1998, and has been producing and exhibiting works of art at places around the world while based in Berlin since 1999. Participated in the 2005 Yokohama Triennale. 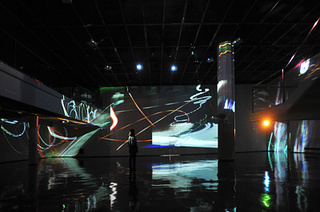 With a special focus on irregular movements in the realm of nature, and occurrences of regular movement in the city, he visually reconstructs the rhythms mediating between both, stages performances following certain rules in order to capture coincidental movements of humans and things, and engages in various other artistic activities observing phenomena related to "motion and time".